Home tinkerer, Github user, and Othermill owner Jetty recently contacted us about a project he made on his shiny new Othermill, which involves making ice fishing slightly nicer for the fish as well as the humans. We’re excited about this project because it employs both a 3D printer and the Othermill for an elegant finished product. It’s a design for a low-energy Bluetooth ice fishing tip-up alarm. It talks to a neck-worn unit that you have in the tent for tip-ups that are outside the tent (it gets cold up north). When a fish bites, an alarm on my neck goes off. 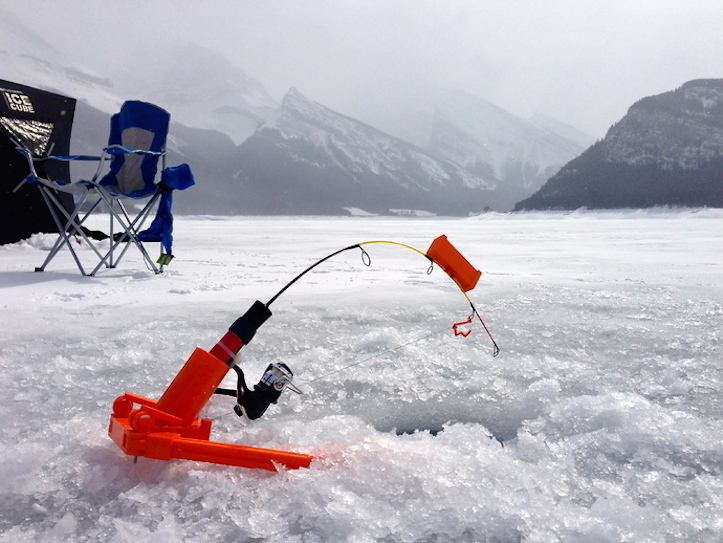 Ultimately it’s better for fish that are being released because, when ice fishing, people often don’t see the tip-up go off and the fish remains hooked for a while, which increases fish mortality. It’s a wireless revision of this and is associated with this. The BLE design uses an RF22301 (BLE and MCU combined in a small package, Arduino IDE compatible) and an LIS3DH accelerometer. It’s also a very low-current design, only using 10uA when not triggered, so it runs off a CR2032 battery. When triggered, it pulses the buzzers, lights an LED (for night fishing), and notifies the remote unit. The alarm automatically arms/disarms as you get close to the unit. Multiple alarms can be used with one remote. Also, note that the CR2032 coin cell battery on the circuit board (shown in the first image) is about 20mm (roughly 0.75") across. If you use the battery for scale, you’ll see that there are some tiny traces on that board. We love showcasing your projects! Tell us a little about them by emailing support@othermachine.co!